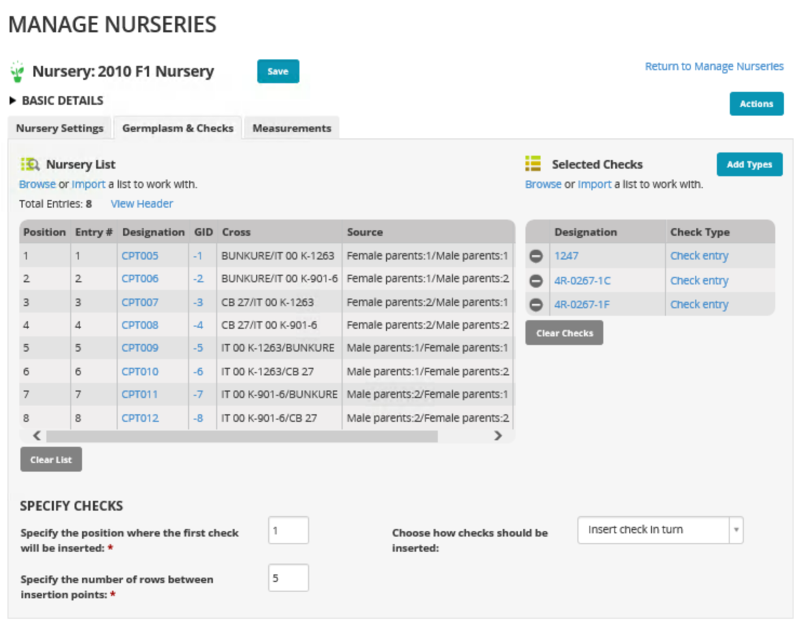 The nursery manager is a tool for designing nurseries. The nursery manager adds nurseries to the program database and provides the basis for developing field maps and labels to assist planting. Create data collection workseets in a variety of formats, including digital recording and barcode scanning, and import back to the database directly. In this nursery no nursery conditions are specified. Plants will be described with field notes. Selections will be described by number of plants selected. The breeding method, single plant selection, has been chosen. 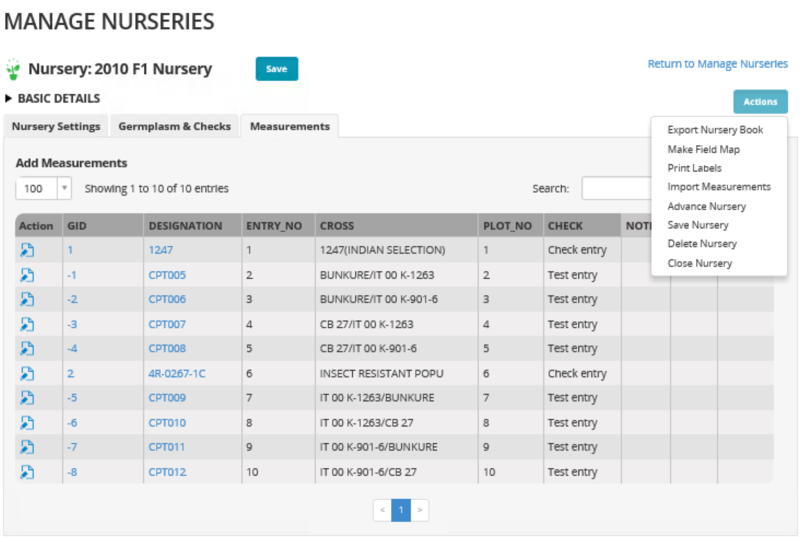 Select the Germplasm & Checks tab to browse or import nursery lists and checks. Specify the details of check positions. Once germplasm and checks are saved to the nursery, field layout and labels can be designed. Data collection sheets are also available for printing or for download to a handheld data logger. Any changes to the germplasm or checks at this point will over write the associated nursery design elements. After a nursery has been saved with germplasm, the Actions button reveals a dropdown menu of nursery management tasks. 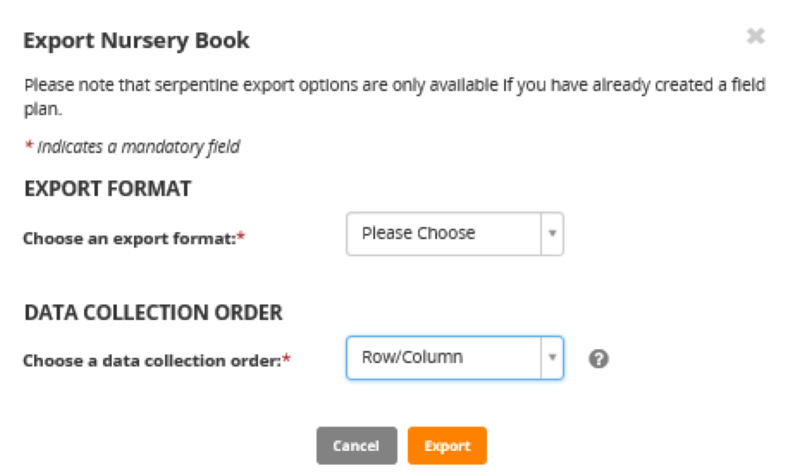 Select Export Nursery, and choose export format and data collection order from the dropdown menus. Select data file to import. The data will load into the BMS. Select Save to upload the data to the BMS database. Once nursery data is loaded into the database, the associated germplasm and checks become locked. Enter details about the nursery advancement. Save the Advance List, which in this case is the F2 list. Highlight lines of interest for seed inventory and select Update Inventory from the Inventory Actions dropdown menu. Enter the seed inventory details for the selected germplasm.